The UK has passed a significant Superfast Broadband coverage milestone. Across the nation more than 95 per cent of premises (residential and business) now have access to Superfast Broadband offering 24Mbps download or faster speeds. A report on the news, published by Think Broadband, puts the exact figure at 95.0079 per cent. The 95 per cent figure isn’t a consistent representation of the broadband speeds in every area of the UK. Some regions such as Epson and Ewell, Tamworth, Worthing and Watford have nearly 99 per cent coverage. Meanwhile, at the sorry end of the table, there are regions that include The City of London (50.3 per cent), the Orkney Islands (66.8 per cent) and Hull (71.7 per cent). You can check the latest rank, coverage, and speeds data for the 650 UK constituencies here. The above mentioned legal right stems from the Universal Service Obligation, a promise of high speed broadband (10Mbps or faster) for everyone by 2020. 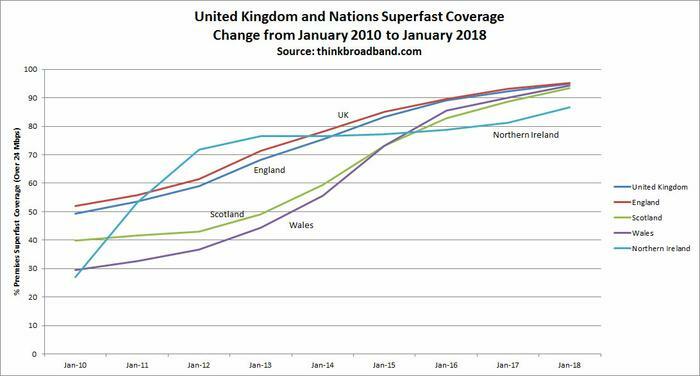 Meanwhile more and more people should get superfast broadband as fibre and similar super fast connectivity continues to roll out. Remember, there are more targets to be met ahead of us; the government aim to achieve 97 – 98 per cent superfast broadband coverage sometime in 2019, for example. Waiting for comments from people saying ~“well mine is still terrible so this isn't true”. How the hell is 24Mbps considered “Superfast Broadband” in 2018? Roughly 10 years ago I signed up for 30Mbps ADSL, which at that point was pretty fast given the general absence of fiber optic infrastructure. These days I'm on 500/500, which I consider very fast, but certainly not super fast. Across the nation more than 95 per cent of premises (residential and business) now have access to Superfast Broadband offering 24Mbps download or faster speeds. It's important to distinguish between available (allegedly) and what is actually delivered. I'm on an up to 52Mbps service but, only receive 18Mbps, down from 26Mbps three years ago and yet, for the purposes of this coverage goal, probably still count as having more than 24Mbps available. “There are three kinds of lies: lies, damned lies, and statistics.” Mark Twain. So yes, we exceed that target, but as mentioned before, 24Mbps is not ‘Superfast’ these days and there isn't much plurality in terms of suppliers.